Posted by Beth in Movies. The Cleveland International Film Festival is such an incredible experience and this year several of our staff members attending screenings. Here’s a compilation of some movies we saw. A young Louise Brooks has the opportunity of a lifetime to attend a dance institute in New York City in the 1920s, under the condition that she is accompanied by a chaperone. Local housewife, Norma Carlisle, volunteers to chaperone Louise and they embark on a life-changing adventure. Norma seizes the opportunity to find closure with her past and redefine her future. A persistent young girl is determined to take care of her mentally ill father who suffered a traumatic brain injury while serving in Iraq, and now lives with severe PTSD on the streets of LA’s skid row. This movie was beautifully shot with such a powerful message. If you get a chance watch it, be sure to have tissues on hand. Lifelong friends, Tony and Paul develop a software that helps big data companies precisely advertise consumer goods to users. As they are on the brink of breaking into a huge market, their egos force them to challenge each other in a bet. They make a bet that the other can’t live without all their stuff for 100 days. Each day they can reclaim one of their possessions. The movie was hysterical and a great commentary on how much time and energy we spend being consumers. To Kid or Not to Kid is a documentary directed by Maxine Trump. My wife and I previously met the filmmaker and identified with the topic, so our schedule was centered around making sure we were in the audience for one of the screenings of this personal film during CIFF43. Maxine interviews several women and traces her own journey of deciding whether or not to be a mother. She explores how the medical industry makes it difficult for women to make choices about their own bodies. She examines the cultural/societal pressure that pushes women to have children and makes them feel as if something is wrong with them if they don’t either by choice or by chance. Storm Boy is a family drama from Australia directed by Shawn Seet. Geoffrey Rush plays a retired business man. The movie is primarily his reminiscences of his childhood when he raised orphan pelicans. Like the many stories about a boy and his dog or a girl and her horse or any other kid learning about the circle of life from raising a pet this was a bit of a tearjerker. This is actually the second adaptation of a short book by the same name. The production design set in modern day and back in the ’50s is well done, and the cast does an excellent job. View our interview with the producer and writer of Around the Sun here. Around the Sun is an indie drama directed by Oliver Krimpas. This British film consists entirely of two actors having various conversations at a French chateau. Our library was one of the sponsors of it. There are multiple chapters and parallel realities imagined through this film where the young man and woman are at the chateau for different reasons and they meet under slightly different circumstances. They discuss big ideas of science and philosophy and human relationships. It is a bit disorienting keeping the different versions of their story straight, but I liked it. It was a challenge like putting together a puzzle. This film is a documentary about the scandal surrounding Malaysian wealth fund 1MDB. Investigative reporters from The New York Times and Wall Street Journal manage to trace the money trail and unravel the scheme. 3.5 billion dollars was allegedy stolen from a Malaysian government wealth fund called 1Malaysia Development Berhard. This fund was intended for strategic development projects in the areas of energy, real estate, tourism and agribusiness in Malaysia. To the utter dismay of the Malaysain people, this fund evolves into one of the world’s biggest white collar heists. Portions of the allegedly stolen money was used to bankroll the 2013 Leonardo DiCaprio blockbuster Wolf of Wall Street. This is a compelling film about greed and a financial scandal of global proportions. As a viewer, I was very engaged and on the edge of my seat. Posted by Beth in Movies, Music. some of the top movies and music albums coming out this month. Place your holds today! I’m a comic book fan, so I’m a bit biased towards the genre. Honestly, I prefer older Peter Parker as Spider-Man as I’m used to him. So Spider-Man: Homecoming was a good movie to me, but lacked some of the things I’m accustomed to in the comics. After seeing the end credits of Venom, I wasn’t sure what I’d get as the scene was so silly. While this movie does have some silliness, there are many reasons why it won the Oscar for best animated film in 2018. Right from the opening, alternate credits give a feeling for the raw style this movie is going for. The movie starts off with a recap of the life of Peter Parker (Chris Pine) over the years. It’s very similar to Sam Raimi’s Spider-Man but it has some clear differences. We get a feel for a very triumphant life of Peter vs the evil he faces. Then we cut to Miles Morales (Shameik Moore) and his daily life. Very early on we get the feeling of a teenager struggling to fit in. He wants to be ordinary at public school, but his parents want him to strive to be better at a highly exclusive private school. After school, Miles goes to see his uncle Aaron (Mahershala Ali). They have a good rapport together and eventually go to a hidden area to do some graffiti. There Miles gets bitten by a spider with the number 42 on it. The next day Miles wakes up feeling off. He ends up getting his hand stuck to a girl’s hair who is played by Hailee Steinfeld. Then he ends up in his room reading a Spider-Man comic. He sees that he appears to be going through the same things as Spider-Man. Later that night, he goes to the same place he was bitten by the spider and investigates it. While he’s there he gets drawn into a fight between Spider-Man and the Green Goblin. Spider-Man is moderately successful against Goblin and The Prowler, but then things go wrong and Peter gets trapped under some rubble. Wilson Fisk (Liev Schreiber) proceeds to finish Peter off leading to a shocked Miles fleeing only to have the terrifying Prowler pursue him. Later at Peter’s grave, Miles bumps into someone wearing part of a Spider-Man suit who can shoot webs, played by Jake Johnson. Miles accidentally knocks him out and we get the chase scene used to promote this film found at the end of Venom. There’s a lot more to the movie than this. We get to see more incarnations of Spider-Man as many promotional materials have shown. Each character has their own interesting take on the lore and many are played by well-known actors. Spider-Man: Into the Spider-Verse really does a great job bridging the gap between comics and accessibly through its animated format. It’s funny, action packed, and even has some deeply emotional scenes. The animation style is a bit jarring at first and I was worried about it being an issue. After a minute or two, my brain adjusted to the movement. The style overall lends itself to creating a feel like the comics with even noise lines coming out of a character’s mouth when they laughed. With how well it’s critically received, I wouldn’t be surprised if this becomes the standard to measure others against. I saw it three times in theaters, so I really enjoyed it, and I’ve not heard anything negative from someone who has seen it. Rated PG. Posted by Dori in Book Awards, Book List, Fiction, Historical Fiction, Literary Fiction, Movies. Can I be honest? I love St. Patrick’s Day. Sure – it has something to do with my heritage, though we didn’t celebrate much as kids. Green is my favorite color, so maybe that’s it? It’s not all the drinking, but I admit I enjoy both Guinness and Jameson’s. I think it must be the Irish culture, the beauty, the pain, the underdog quality of the Irish – their writers and artists, their language, and, of course, the wool (and the sweaters)! And it always means that Spring is around the bend. Below are a few movies and books that celebrate Ireland, the Irish and Irish writers. If you are looking for more movies, I highly recommend checking out The Irish in Film: a Database of Irish Movies – it’s incredible! This is the third movie released in theaters of this series. 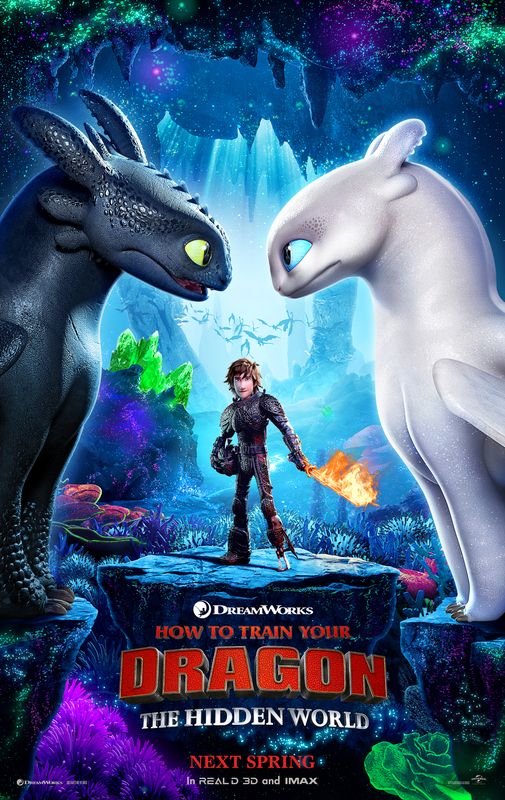 Since 2010 How to Train Your Dragon has been a popular series. There have been several TV specials, direct to DVD specials, and a Netflix series with 6 seasons. It’s also based on a book series by Cressida Cowell. To say this series is popular is an understatement. While DreamWorks creates the movies, this is the first trilogy ever to have three different studios release them. Paramount released the first, 20th Century Fox released How to Train Your Dragon 2, and Universal Studios released this one. The movie starts off set a year after the second one. The team of dragon riders such as Hiccup played by Jay Baruchel and Astrid played by America Ferrera are working as a team to stop the dragon hunters. Valka, played by Cate Blanchett, acts as a mentor to the group of the young dragon riders on these missions. The group of dragon hunters band together, sick of the riders of Berk, and hire a mercenary called Grimmel, played by F. Murray Abraham, to capture Hiccup’s dragon Toothless to help them control the other dragons as Toothless is a king of dragons. Grimmel seems to be a brutal challenge with his own subdued dragons under his command. Grimmel has killed every night fury (the type of dragon Toothless is) and is determined to hunt Toothless down. ragons. Grimmel seems to be a brutal challenge with his own subdued dragons under his command. Grimmel has killed every night fury (the type of dragon Toothless is) and is determined to hunt Toothless down. Toothless was thought to be the only dragon of his species left. They discover a dragon that has a white coloration of a night fury. It’s a female version of his species they nickname a “light fury”. Toothless is interested in finding out more about her. After a particularly dangerous attack by Grimmel, Hiccup decides to leave Berk with the rest of the village and their dragons to take them to the legendary home of dragons his father told him about, The Hidden World. As they travel they keep encountering the Light Fury and Hiccup starts to come to terms with the fact that he’s not the only one important to Toothless anymore. The movie had some pretty good scenes and was funny at times. It didn’t feel quite as epic as How to Train Your Dragon 2but it was still satisfying. The ending wrapped things up well even if it’s not necessarily what everyone was hoping for. The series does tell a good story between Toothless and Hiccup. I wouldn’t be surprised if DreamWorks made some more stories for this world, particularly between the movies. So, it’s bittersweet for fans but a good journey. Rated PG. My name is Ryan and I see a lot of movies. So, I thought I’d try to share my experiences with them. I find that movies are a very good social experience that are fun to watch with someone and talk with people about later. I make it a point to try to see a movie if it sounds interesting or has high enough reviews. Sometimes a small tidbit of information can be the difference between seeing a movie or not for me. John C. Reilly) a character from a video game struggling with the fact that he was a villain in his game. He goes on a journey to prove he’s a hero and ends up becoming friends with a girl called Vanellope (played by Sarah Silverman). After the events of that story, Ralph Breaks the Internet continues their story with Vanellope bored with her routine. Ralph tries to help her by making a new track one day and the player trying to steer the game ends up breaking the arcade game. When it seems like the game will be unplugged forever, they hear about the internet and a place where they can buy a replacement part. The characters venture into the recently setup wifi at the arcade into the internet. They journey into the internet where they win a bidding war for their part and soon realize they need to earn money for it. They try a few ways to do so including trying to sell Shank’s car from another video game. Venellope becomes friends with Shank (played by Gal Gadot) as Shank’s racing game is much more intense than Vanellope’s. Ralph and Vanellope move on to try to use ad revenue from videos with the help of Yesss (played by Taraji P. Henson). Ralph starts making money to save the game. While advertising these videos, Vanellope even bumps into the Disney princesses at the Disney sight, with many of them voiced by their original voice actors. Posted by Dori in Book List, Fiction, Literary Fiction, Movies. Happy St. Valentine’s Day! Grab some chocolates, a glass of your favorite beverage and curl up with a book or a movie. Enjoy! Posted by Mary in Biographies, Book Awards, Book Discussion, Debut Author, Fantasy, Fiction, First Novel, Graphic Novel, Movies, Non-Fiction, Science Fiction, Uncategorized, Young Adult. Below are some suggestions of movies based on a book to encourage you to check off that box on your Winter Reading Bingo card. Ready Player One is a science fiction film based on the 2011 dystopian novel of the same title by Ernest Cline. On Chesil Beach is a British drama film based on the 2007 Booker Prize nominated novella of the same title by Ian McEwan. Juliet Naked is a romantic comedy/drama based on the 2009 novel of the same title by Nick Hornsby. Crazy Rich Asians is a romantic comedy/drama based on the 2013 best selling novel of the same title by Kevin Kwan. A Wrinkle In Time is a science fantasy adventure film based on the 1962 juvenile novel of the same title by Madeleine L’Engle. Black Panther is a super hero film based on the Marvel Comics character of the same name. Red Sparrow is a spy thriller film based on the 2013 novel of the same title by Jason Matthews. The Little Stranger is a gothic drama film based on the 2009 novel of the same title by Sarah Waters. If you would like more suggestions stop by the Adult Reference desk and we are happy to help. Posted by Mary in Book Discussion, Debut Author, Fiction, Historical Fiction, Library Program, Literary Fiction, Movies, Non-Fiction, Uncategorized. There is so much to like about this book. The two main characters are flawed, however, you will yearn for them to rise up & come to terms with their lives. I learned about Chicago (my home away from home), Paris, both present day and in the 1910’s, inspirational artists who were sowing their seeds in Paris in the early 1900’s, and last, but certainly not least, the AIDS epidemic at its height in 1980’s Chicago and its tragic aftermath. This is a fantastic piece of historical fiction. Sunja, the main character, is an unconventional matriarch, whom we follow throughout the entire story. It begins in the early 1900’s with her birth, and culminates in 1989. This story is about 4 generations of a Korean family coming terms with what it is like to be Korean in a Japanese society. There is much to learn here about the perils and struggles of the Korean community. This is another superb historical fiction book. I learned a lot about tea… so much tea. Again, the main character, Li-Yan, is unconventional, yet so strong in her own quiet ways. The reader learns about farming tea, life in a small Chinese village, adapting to an ever-changing world, adoption and the impact, not only on the child, but the entire community. I love good narrative nonfiction, and this certainly fit the bill. It never ceases to amaze me when I read about the resilience of children growing up in a very chaotic environment, raised by a parent lacking in nearly all conventional parenting skills … and yet these children survive, and in this case, achieve great academic success despite the odds. These type of books are great for book clubs because, trust me, you will want to talk about it. This title was also the Library Community read. Unlike, the book above, not everyone is a survivor in this one. This book is about residents in low income neighborhoods in the city of Milwaukee, desperately trying to make ends meet, despite the unjust housing system in which they live in. This is a very engaging, readable piece of nonfiction. I didn’t know that I liked Ethan Hawke so much. I have not watched a movie this year that he has starred in that I didn’t love ( Maudie and Maggie’s Plan both wonderful too). This is a moving, yet feel-good kind of movie. It’s all about choices, second chances and moving forward. I will admit that I nearly turned this movie off about 45 minutes in, and then everything changed, so hang in there. Tully is such a simple yet complex woman struggling with “the baby blues”. If you are like me, you will have compassion for Tully, you will understand Tully, in the end, you will love Tully. This film is a heartfelt & sweeping documentary of Alec Baldwin’s experiences in the tumultuous 60’s. You will be thinking about this one long after you hit the eject button. There is so much to learn about the great African American leaders, and the american experience of the African American community. We have so much to learn from our history, we simply need to take the time to listen. I tried to stay away from Academy Award nominees & winners because they must be good, right? Not always the case for me, but with this film, they hit the nail on the head. Another feel-good film that follows a couple of artists pursuing…well, their art. Their relationship is so charming, their travels are interesting, and their art is wonderful. What more do you need? Okay, I will admit I watched this one because I want to look like Amelie. Who doesn’t want to look like an adorable French woman? After watching this film, I want to be Amelie. I want to be a free spirited, unique, adventurous, kind & beautiful young french woman…oh, and live in France. For now I will live vicariously through this charming movie. By the way, it is in French, and watching foreign films makes me feel smart… another bonus! I eyed this film on the shelf FOREVER, and it did not disappoint. This is a wonderful coming of age story about a 13 year old boy, but so much more. The film is about relationships, gentrification in Brooklyn, self discovery for the young and the old. Don’t judge these characters to hastily, they may surprise you. I hope you can make time for, at the least, one of my choices in 2019. I would LOVE to hear about your choices too. Stop by at the Adult Reference desk & we’ll chat. Meanwhile, my best for a happy new year!